I’m Beau Miller and I am running for Judge of the 190th (Civil) District Court in Harris County. I’m a trial lawyer in Houston with 17 years’ experience in the courtroom, representing plaintiffs and defendants, individuals and corporations. The 190th District Court is a Civil Court, and hears cases involving title to land, election contests, civil matters in which the amount of money damages involved is $500 or more, and other matters in which jurisdiction is not placed in another trial court. I strongly believe that everyone should have fair access to our courts and a fair shake when they get there. Too often judges’ political or personal beliefs interfere with the rights of individuals to have their day in court. I know that when judges don’t do their jobs effectively every day, the wheels of justice grind to a halt – and grind down hard-working people with limited resources who are just trying to have their case heard. My experience in advocating for the rights of vulnerable individuals and in handling complex and challenging litigation, together with my track record of promoting diversity in the legal profession, make me a strong candidate for judicial office. If my campaign is successful, I will use my legal expertise, real world experience, and solid values to ensure that justice is done in every case that comes before me. I am an experienced trial lawyer and I hope to make a significant and positive contribution to access to justice for the residents of Harris County. In my 17 years in the courtroom, I have represented a broad range of clients. As a civil rights lawyer, I understand discrimination and the critical role our judicial system can play in creating a community in which everyone can seek justice. Finally, as a leader in several community organizations, I have learned the importance of ensuring that everyone who participates in the legal system – parties, lawyers, witnesses, jurors, and courtroom staff – is treated with the dignity and respect that should be accorded to all people. Through my years of courtroom experience I have had the good fortune to observe and learn from many excellent judges. In my own practice I have made every effort to treat my clients, my opponents, and the court fairly and respectfully. As a result, I believe I have a solid reputation in the legal community as a lawyer who knows his way around the courtroom and will work hard to ensure that justice is done. The residents of Harris County are entitled to be served by judicial officers who will follow the law, respect the facts as they are presented, and judge each case fairly. Unfortunately, some judges do not always approach their role in a similar fashion. As a result, some litigants find that extraneous factors, including political considerations, can tilt the scale. It is critically important that every judge be impartial and unencumbered by personal, political, or religious bias. I am committed to bringing that kind of judicial integrity to the bench. Because I am committed to fairness. We operate in a world that sometimes falls short of our ideals of justice and equal treatment under the law. It is time to ensure that every member of the Harris County judiciary is impartial, and dedicated to the rule of law. I intend to exercise exactly that kind of fairness in every case I hear. My experience, strong work ethic, common sense, and understanding of how the law actually affects real world situations will all help me to judge cases fairly. Finally – and importantly – I will bring the highest standards of personal and professional ethics to the role and won’t allow any form of bias to cloud my judgment. As Texas’ Tuesday voting registration deadline approaches, Nasser and a number of other deputy voter registrars, volunteers allowed to register voters on the spot, were out in force Saturday evening. 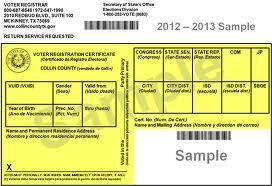 While many states allow voters to register the day of an election, Texas voters must register one month before. The last day voters can register for the Nov. 6 election is Tuesday, since Monday is a federal holiday and the voter registrar office will be closed. Voters who still need to register must visit their county voter registrar office to drop off a completed application or print and postmark an application to their county voter registrar by Tuesday. People can also register to vote when they obtain or renew a driver’s license. As part of the Motor Voter Act, a federal judge has ordered Texas to allow voters to register online, but such a system will not be implemented in time for this midterm election because the order has been stayed while Texas Attorney General Ken Paxton appeals the decision. Nonetheless, the Texas voter rolls have grown to 15.6 million people, a new record that is 1.6 million higher than the last midterm election, according to Texas Secretary of State Rolando Pablos. The last way to register is through a deputy voter registrar, which is why Nasser and a number of volunteers were standing outside the Festival Chicano. States occasionally remove voters from the rolls. Such removals are meant to target felons and the deceased. Texas, however, sometimes mistakenly purges voters by incorrectly presuming them dead, according to a report by New York University Law School’s Brennan Center for Justice. Sometimes other mistakes are made, such as when 1,700 voter registrations were mistakenly suspended this year due to what Harris County Tax Assessor-Collector Ann Harris Bennett called a software glitch. Voters can check whether they are registered on the Texas Secretary of State site, although the webpage is not the official register of a voter’s registration, which is instead kept by county voter registration offices. Basically, if you were registered before and you haven’t moved, you should still be registered. You can certainly check if you want to – in Harris County, I’d go to the Tax Assessor website and search there; go to your county’s elections administration page if you’re in a different county – but if you’re a previously registered voter, you should have gotten your updated registration card this January. If you did, you should be fine. We’ll see how high the final numbers get. The last update from Harris County was over a month ago, and I expect that to be up. I think we might approach 16 million, but that’s a bit optimistic. Nate Cohn, who is doing one of those “live polls” of the Senate race here, says their model is projecting 6.3 million voters for turnout, which is right at 40%. That’s what we had in 2010, by the way, but with far fewer voters. It starts with registration, that much is for sure. The DMN has more. Security companies spent years pushing schools to buy more products — from “ballistic attack-resistant” doors to smoke cannons that spew haze from ceilings to confuse a shooter. But sales were slow, and industry’s campaign to free up taxpayer money for upgrades had stalled. That changed last February, when a former student shot and killed 17 people at a Florida high school. Publicly, the rampage reignited the U.S. gun-control debate. Privately, it propelled industry efforts to sell school fortification as the answer to the mass killing of American kids. Since that attack, security firms and nonprofit groups linked to the industry have persuaded lawmakers to elevate the often-costly “hardening” of schools over other measures that researchers and educators say are proven to reduce violence, an Associated Press investigation shows. The industry helped Congress draft a law that committed $350 million to equipment and other school security over the next decade. Nearly 20 states have come up with another $450 million. Most everyone agrees that schools can be more secure with layers of protection, such as perimeter fencing, limited entrances and classroom hiding spaces. But there’s no independent research supporting claims that much of the high-tech hardware and gadgets schools are buying will save lives, according to two 2016 reports prepared for the U.S. Justice Department. There also are no widely accepted standards for school building security, as there are for plumbing and fire protection systems. That has not stopped industry representatives from rushing in, as they did in past high-profile shootings, some stoking fears that “soft target” schools could suffer terrorist attacks or negligence lawsuits. Educators worry that hardening will siphon focus and money from programs that prevent bullying and counsel at-risk kids. Students have reported in government surveys that metal detectors, armed officers and similar measures make them feel less safe. School psychologists like Tricia Daniel say campuses are more secure when students feel comfortable reporting suspicious behavior and trained staff can decipher whether that behavior is dangerous. Yeah, but where’s the profit in that? Gosh, I just can’t understand why some people don’t see capitalism as such a good thing anymore. Wherever could they have gotten that idea?